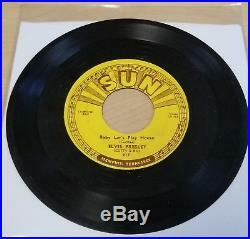 Elvis Presley: Baby Let's Play House, b/w I'm Left, You're Right, She's Gone (45). True musical history here in this very rare single! 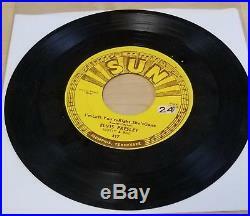 One of Elvis' first recordings on the original Sun label. Single shows minimal wear for its age and both sides have been tested - it plays fine, no skips, and sounds great cranked up - especially if you love the sound of a very young Elvis when he was just starting out. 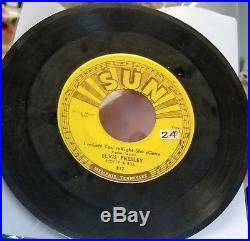 The item "Elvis Presley Baby Let's Play House / I'm Left Your Right She's Gone, Sun 1955" is in sale since Friday, August 10, 2018. This item is in the category "Music\Records". The seller is "mhdallas69" and is located in Baton Rouge, Louisiana. This item can be shipped to United States.